If you’re not currently leveraging email to communicate and engage with travelers and guests, you’re missing out on a huge opportunity. As social media channels and search engines become more saturated and more competitive for businesses than ever before, property managers like you are stepping up their game when it comes to email marketing. The number of email users worldwide is forecasted to rise to 2.9 billion by 2019 (WordStream). The number of email users in the US was projected to grow to 244.5 million by the end of 2017, and 254.7 million by 2020 (WordStream). 73% of millennials identify email as their preferred means of business communication (WordStream). 86% of online consumers actually want to receive promotional emails on a monthly basis (Sleeknote). Email is 40 times more effective at acquiring new customers than Facebook or Twitter (Campaign Monitor). When it comes to purchases made as a result of receiving a marketing message, email has the highest conversion rate (66%), when compared to social, direct mail and more (DMA). Every dollar spent on email marketing generates a $38 return and delivers a three-fold increase in purchases compared to spend on social (McKinsey & Content Magazine). Email can be an incredibly useful and worthwhile tool to leverage if you’re at all interested in boosting property awareness, establishing and nurturing relationships with leads, and driving more people to take action and book reservations at your property in the months ahead. The question is, where do you focus in order to get the most ROI from your efforts? When it comes to email marketing, the welcome email is one of the most important campaigns you will ever send to your subscribers and leads. Because in many cases, it’s the first opportunity you have to interact 1-on-1 with the person you’re ultimately trying to establish and nurture a relationship with. Welcome emails set the stage—and the mood—for all future interactions that you’ll have with your recipients. A poorly written and poorly executed welcome email can leave a sour taste in the mouths of the people that you’re ultimately hoping to convert into future guests. A well-written welcome email, on the other hand, can help you create the right first impression, set expectations, and start building immediate trust and loyalty with people from day one. So, what makes a welcome email great? There are a number of factors to consider and test along the way, but one of the most important ones you need to know about now in order to be effective from the get-go is personalization. Effective email campaigns all leverage personalization—a tactic that makes recipients believe that the emails they are receiving from you have been customized for them specifically. Actionable Takeaway: When sending welcome emails to blog subscribers or people who have requested more information from one of your reservation agents, personalize subject lines, salutations, and body copy with first names. It’s the least you can do to show people that you actually care about them as individuals. Most email automation providers make it fairly easy to add and auto-populate personal information (like first name) from contacts into the welcome campaign you ultimately want to build and turn on for all new subscribers or leads who get added to your list. Want more tips on how to make your welcome email more effective? Read through this helpful blog post from Campaign Monitor. It outlines 10 effective elements that your welcome emails need to have to resonate with recipients. The follow-up is another important email you should be baking into the email marketing strategy you build for your property and for your reservation/sales agents. Every week, the average online consumer is getting flooded with marketing emails from the brands and businesses they’ve supported in the past or want to know more about. Their inboxes are a lot noisier today than they were 5 or 10 years ago. As a result, a lot of the messages from businesses that make it into their inboxes are ignored and never opened. 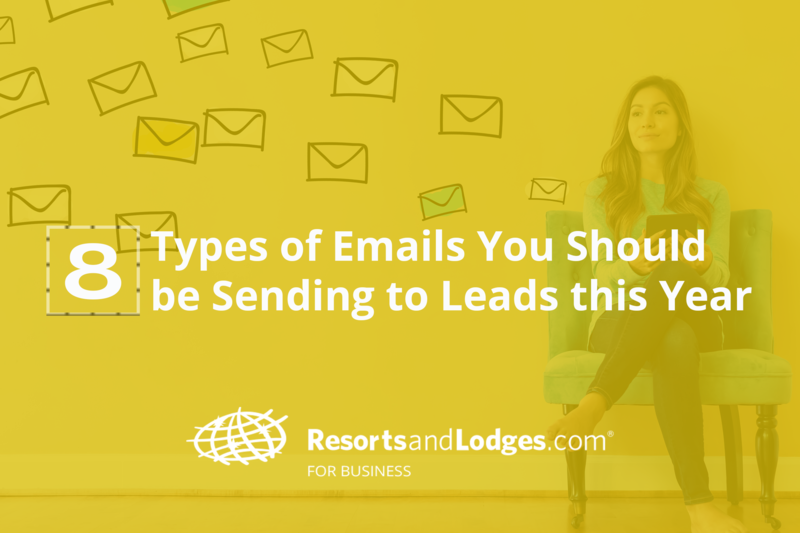 As a property manager, it’s your job to recognize and help your team of reservation agents recognize that some travelers are going to need to receive more than one email before they decide to respond or take the action you want them to take. Actionable Takeaway: Don’t give up on a lead just because they haven’t responded to the first few emails you’ve sent their way. Make an effort to follow-up at least once or twice before moving a lead into your inactive bucket. There really is no easy equation for writing effective follow-up emails—it’s something you need to test internally to find out what kind of messaging, timing, length, and other elements work best for your particular audience. Keep your follow-up email short and sweet. Make it easy for recipients to understand what you want them to do (ex. reply, click a link, unsubscribe, schedule a phone call, etc.). Focus on them, not you. Don’t come across as desperate for a sale. Be desperate to help your recipients plan the perfect trip and create unforgettable experiences. Want to learn more about how to write and send effective follow-up emails? Check out this helpful guide from Close.io. What questions do you still have about our property? What kind of trip are you interested in planning? What is most important to you when staying at a resort or hotel? What’s keeping you from booking a reservation with us? When/how is the best time to try to reach you? Actionable Takeaway: If you haven’t already, build simple follow-up emails into your email marketing and sales outreach drip campaigns. Send inactive subscribers and silent leads a simple, 1-2 sentence plain-text follow-up email and see if you can get them to reply. Remember: keep these emails as simple as possible. The people you’re trying to reach should be able to answer your question in 5 minutes or less. Your goal is to get them to simply respond so that you can begin nurturing the relationship and moving them down the funnel toward conversion. We’ve mentioned it before on this blog: travelers don’t want to be sold on rooms, rates, and other amenities alone anymore. Now more than ever before, they want to be sold on the promise of unique and unforgettable experiences. Internet-savvy travelers are also now relying on the opinions of others—friends, family members, and even strangers—when deciding where they should travel to and where they should stay. To address both of these areas and win more customers this year, the best thing you can do as a property manager is to commit to creating and sharing more original stories about your property, your team, and the people who choose stay with you. If you’re not sure how to get started, we just published a helpful guide on how to use storytelling to boost reservations over on the TRACK blog. It outlines the main benefits of telling more stories for your business, walks you through the actionable steps you need to take to create winning stories for your property, and even provides you with a handful of ideas to get you on the right track. As soon as you have a few stories created for your property, make a plan to share them with your subscribers and leads in a future email marketing campaign. Remember: inboxes are noisy these days—you need subject lines and subject matter that grabs attention and drives action. Stories are unique. Most businesses aren’t willing to invest the time, money, and energy needed to create them. Instead, they’re using the same email marketing tactics that everyone else is using, and seeing less and less ROI from their efforts. Actionable Takeaway: As you continue working to nurture leads through email, share a compelling story with them that you think would help move them further down your funnel. It could be a video testimonial from a recent guest who enjoyed their stay, it could be a blog post about one of your employees that everyone who stays loves interacting with, or it could be a story about how your property came to be and what makes it so special. The key is to leverage storytelling to better connect with people on an emotional, human level. If you’re creating new blog content on your property website each week, share it with your prospects and subscribers. As a best practice, you should be sending leads a healthy mix of sales-driven and value-driven messages when interacting with them through email. You probably already have the sales drip messaging and sequence down, but you might be lacking on the value side of the equation. Blog posts can help you show leads that you’re not just interested in getting the sale—you’re also genuinely interested in helping them and providing value to them. If you’re not creating blog posts for your property today, consider starting this week. Your blog can be a great tool to leverage for boosting awareness, increasing traffic to your website, capturing leads, building trust, and driving more online reservations. Not sure what to write about? Here are 85 ideas you can look through and borrow for your own blog. Actionable Takeaway: Start sharing blog content in the emails that you’re sending to leads. Don’t just loop everyone into an auto-RSS feed that delivers new emails each time you publish a blog post. Instead, put more thought into it. If you just published a new blog post on your website, share it with your reservation agents and ask them to read it, summarize it, and share it thoughtfully with people on their list that they think would appreciate it. You can and should also incorporate new blog post content into the automated email drip campaigns that trigger each time a new subscriber or lead is added to your list. Despite how important experiences and word-of-mouth both are to interested travelers, they do, at the end of the day, still want to see what your property actually looks like before making a decision about whether or not to book a reservation with you. For that reason, it’s important to create at least one dedicated email that you can send to leads that includes high-quality images and descriptions of the inside and outside of your property, restaurants, and rooms. These types of emails can also include links to videos, additional photo galleries, and any other pages on your website that would help paint a complete picture for recipients. Depending on how much information you have about your leads, you could also customize this email to show information or features of your property that you know a specific lead or group of leads will care most about. For example, if you know your leads are looking for a golf resort, you might send them a personalized email that highlights your golf course and all the amenities that come with it. If you know your leads care about relaxation, you might focus more on sharing photos that feature the spa, the pool, and the other services you provide guests who stay with you to unwind and relax. Actionable Takeaway: Send an email to your leads that highlights the best features of your property. Help people understand what makes you different from local competitors. Focus on highlighting the areas and features of your property that you know guests rave about during and after their stay. To build additional trust with your leads and to leverage yourself as a helpful resource that travelers can turn to when planning their trip, compile a list of things to do in the area and build it into an email campaign that you can send out to subscribers. Remember: internet-savvy travelers aren’t just searching the web and joining email lists to learn about room rates—they want help planning their trips. They want to know what they can experience when they travel to an area, what’s worth seeing, what’s worth skipping, etc. By sending your leads a fun things to do in the area (or relaxing things to do, family-friendly things to do, romantic things to do etc.) email campaign, you can control where they ultimately go for answers by presenting them with the information before they actually go looking for it. Actionable Takeaway: Think about who your audience is and what they do when they stay with you. Where do they spend their time? What businesses or attractions do they visit? Where do they not care to go? Build a list of 24 places to see or things to do in the area, then separate the list into 3 different email campaigns that you can send out at various times as you work to establish and nurture relationships with leads. Finally, don’t forget to send out occasional emails to your list that promote special timely offers or unique themed packages that they can take advantage of. It’s true that travelers these days are motivated by rich photography, personalization, word-of-mouth referrals, and experience-based storytelling, but they also still like taking advantage of a good deal when it presents itself. Actionable Takeaway: Send special offer emails to your list, but don’t overdo it! Make sure to still incorporate a good mix of value-based and content-based messaging throughout your efforts. Doing so will help you build the trust you need in order to convince subscribers to act fast when you send them a deal they can’t ignore. What other types of emails are you sending to your leads? Share your ideas with me in the comments below.